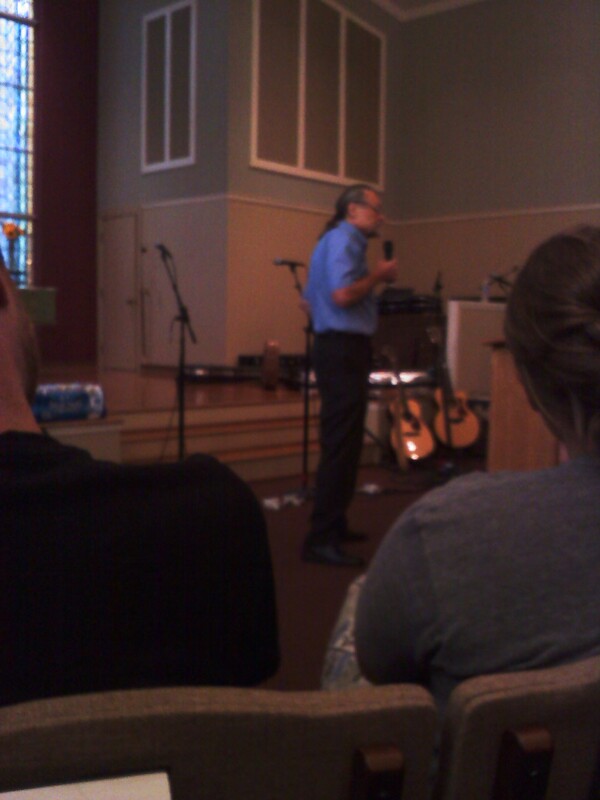 Cameraphone: Walt Wangerin speaks at Hutchmoot. One of the highlights of Hutchmoot for me was author Walt Wangerin‘s (pronounced with the emphasis on the first syllable, and rhyming with wanderin’) talk. Wangerin defined art as composed experience. It puts details into a kind of order, that is then experienced by someone else. Art seeks an audience (a reader, in the case of writing). One creates with the ghost of the audience in the room. This experience is intense. It’s an experience with a beginning, middle and end. It creates its own time and space (other pieces are squished together to give the new work room); it “becomes the cosmos for a time,” Wangerin said. A covenant with perceived reality. This is the standing apart, separation (shyness?) — the third eye — observation and creating requires. A covenant with my craft, with peers in that craft. Know the craft, the righteousness of the language, if only to play against it. Establish good relationships with artists of today. A covenant with the community within which I’m writing. This is the boundaries we choose not to cross to protect our families, our friends. Don’t misuse them. The one we have, which is naming (Genesis 2). The thing named is brought into place so it can be known. A name establishes an item/person’s relation with other name things. The naming action beings to declare the thing’s purpose. This naming is powerful, but also dangerous. A covenant with the axioms inside me, by which I make sense of life and the world. What I write (and/or create) must be consistent with my worldview. It was my first author signing since I’ve been a book blogger, and as signings go it was pretty low-key (I think). 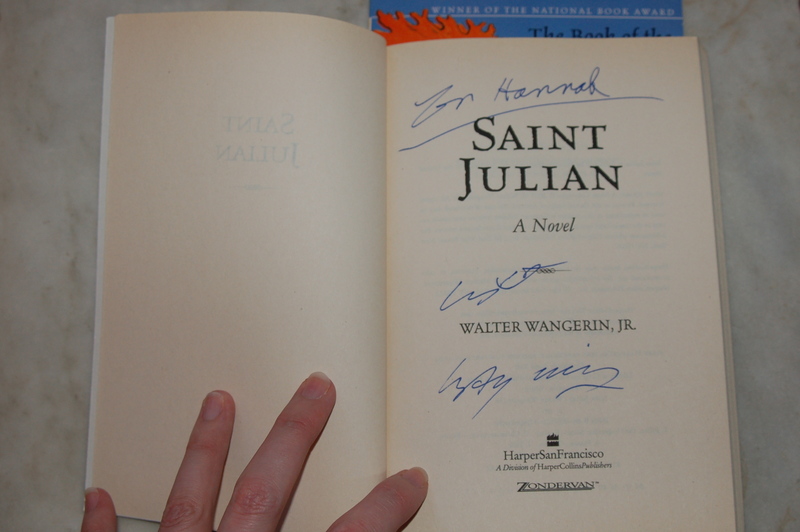 I had him sign two of my books, both The Book of the Dun Cow and Saint Julian. In all, Wangerin’s visit was one of the biggest highlights of Hutchmoot. 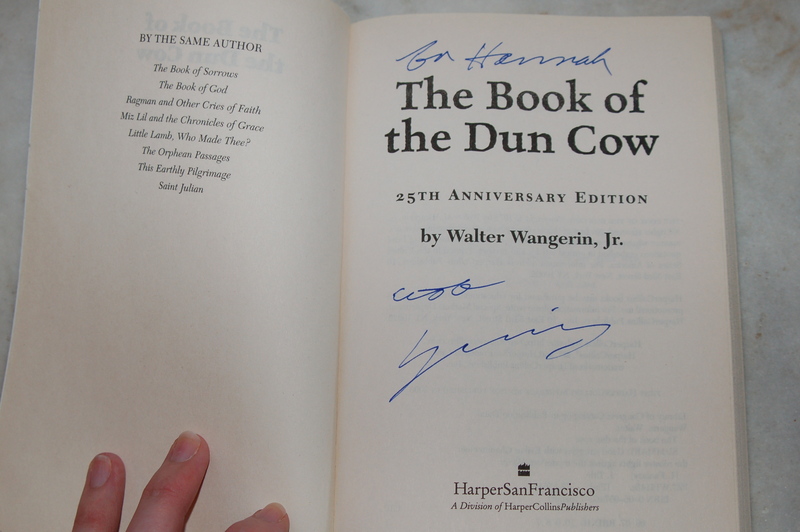 Walter Wangerin Jr. is the author of 30-plus books, including The Book of the Dun Cow (his first novel) and Saint Julian (one of his most recent). He teaches literature and creative writing, and is writer-in-residence, at Valparaiso University in Valparaiso, Indiana. This entry was posted in writing and tagged author, Hutchmoot, signing. Bookmark the permalink. I wish I had been aware of this conference—I visited the site and all of it was warm and inviting . . . reminded me of a fire in a fireplace. Wish I could have pulled up a comfy chair and spent time with others drawn to such a place. I’m curious about the phrase in 2b, the “righteousness of language.” I like it, although I’m not really sure what that means. Hannah I am breathing in this post and what an experience! I like the signed books because they remind me of the event and the author. I try to put a picture of the event/author in the books so i can have the full memory of when I received the book.